I was kindly invited along to see Jacqueline Wilson's world famous story, 'Hetty Feather', bought to life on stage at the Theatre Royal Plymouth. I went along with Becca and her niece, Isabella- The theatre was packed with children and adults alike; it seemed that a varied audience really enjoyed this show! Growing up I had always been a massive Jacqueline Wilson fan- I read every single one of her books and of course, Tracy Beaker was my favourite TV show too! So I was really looking forward to seeing one of her newer novels adapted to a stage show through my older (whether I'm more grown-up is questionable) eyes. 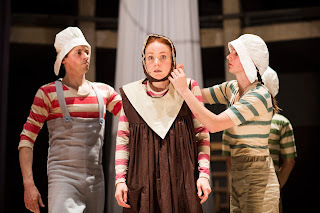 Set in Victorian 1876 in London, Hetty Feather is an abandoned baby at the Foundling Hospital; Though she gets fostered until the age of five, Hetty lands back at the children's hospital and dreams of her family, friends and of course the wonderful circus she once visited. The story was really heart-warming and I could definitely feel Jacqueline Wilson's personal touch on the stage adaptation. 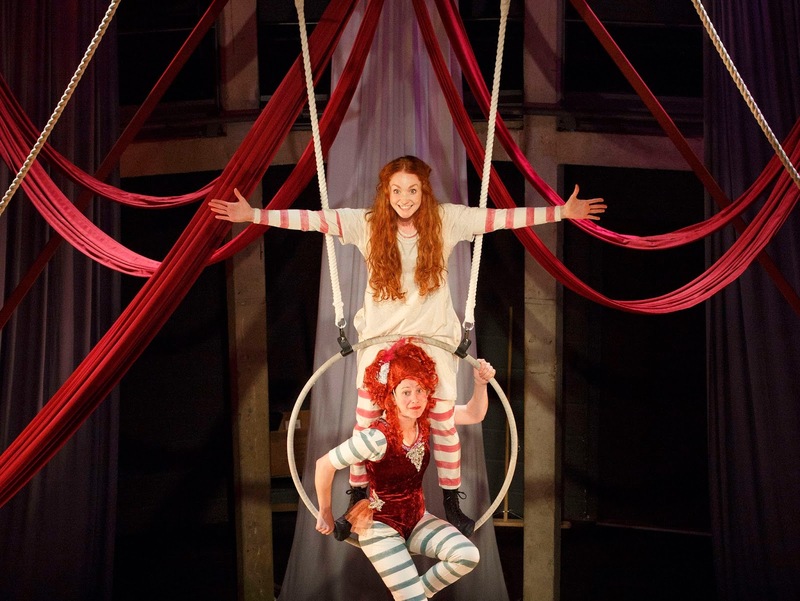 Full of music, acrobatics and jokes, this show is perfect for all the family! The show was really funny, especially for the children (though Becca did have to nudge me because I couldn't stop laughing at one joke...). From an adult perspective, I really appreciated the gorgeous set which was designed to look like gymnastic apparatus from a circus, complete with silks and even a music corner for the live musicians who played specially composed pieces for the show. The cast was relatively small and so the actors took on several roles each- only using props and a change of costume, they successfully transformed into a brand new persona in seconds. Truly impressive. 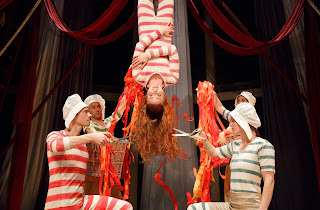 My favourite parts of the show were when the actors performed acrobatics and aerial dance- it was really beautifully done and although acting as childish characters, they performed it with vigour and such professionalism. Of course, this is a children's story for children- so if you're looking for a fast-paced, action- packed, thrilling show, this probably isn't the one for you. But I definitely think that is a great evening out for a family and would recommend it to anyone with children. Disclaimer: The Theatre Royal Plymouth kindly invited me along to this performance but all opinions are my own :) Photos credited and are not my own.